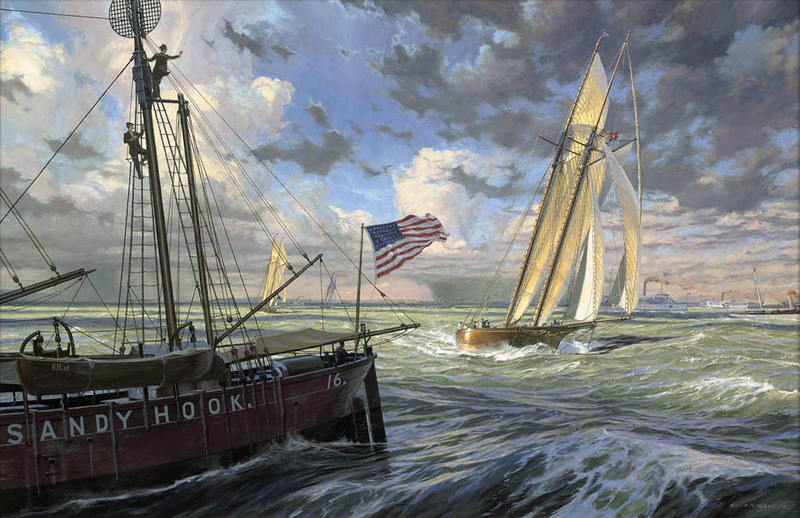 The schooner MADELEINE approaches the SANDY HOOK LIGHTSHIP, outer mark of the second race of the 1876 defense of the America's Cup. Not far behind, and well ahead of the Canadian challenger COUNTESS OF DUFFERIN. is the 25-year-old AMERICA, winner of the original 1851 contest. Crew were stationed aboard the lightship for months on end; surely this day would have been a welcome break from the routine. This original painting will be included in the "Sporting Life" Exhibition at the Lyme Art Association through September 21.